Ex-Wives club: Great minds dress alike, originally uploaded by Suddenly Single. Kara and Marina had their college night and when Tabitha showed up to pick me up, I giggled. 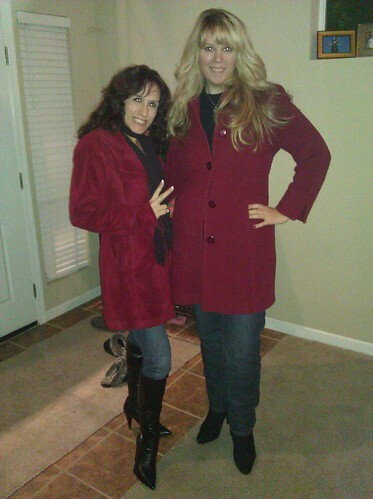 We were both wearing jeans, black boots and a red jacket. Apparently the ex-wives club has a dress code! This year so far has been amazing. I’ve added a few more things to the list of crap I am doing to keep moving. In February I am walking the Golden Gate bridge. Seeing that I am dragging poor Tabitha along on all the things I’m doing, I invited her to be my Valentine’s date on the bridge. She has agreed to join me. This means of course that I will need to help her clean her car so she can drive us. I signed up for a 5k in April…and yes, I talked this poor woman into it too. I am SO proud of her. She’s been going out in the mornings and running to prepare. We have a theme song, “Ain’t no stopping us now!”. It’s amazing how your life can change when you start looking at yourselves through the eyes of those that TRULY loves and cares about you. We see strength in each other and don’t forget to remind each other of those strengths. There are times when we forget how awesome we are, and just about then we are reminded. Sometimes by the sheer stupidity of other people we are reminded. We are up to about 30 people that are going to climb Lassen in August. I put it up on Facebook and there are some people not on Facebook that are going that have committed. I’m aware that probably more than half may be unable to attend when the time comes, but I am doing my best to keep people motivated. I contact my friend Matt every other day or so to check in on his progress. I swear, people need to not telling me what they want to do when they are drinking. He told me he wanted to lose weight so I gave him my treadmill and I am hounding him. I’m sure he’s going to kill me by the end of February. Did I mention how much I think running is just retarded all the way around? It is. totally wrong. So on that note, my life is busy and that is good. It gives me less time to think about my personal life which is…chaotic and confusing. I just know where I am in my life and I have no control over where anyone else is. I know what is enough for me. It’s enough that I have many great things coming up including the Oka Cup which I can’t want to go to and get some amazing pictures and enjoy time with all my sky family. I’m bringing Chocolate cake for Craig to insure I have a spot on the floor when I pass out from too much fun. I am…and I am not alone. I have a lot of people cheering me on.